The Naturalest Naturalist: Citrine Wagtail Twitch! 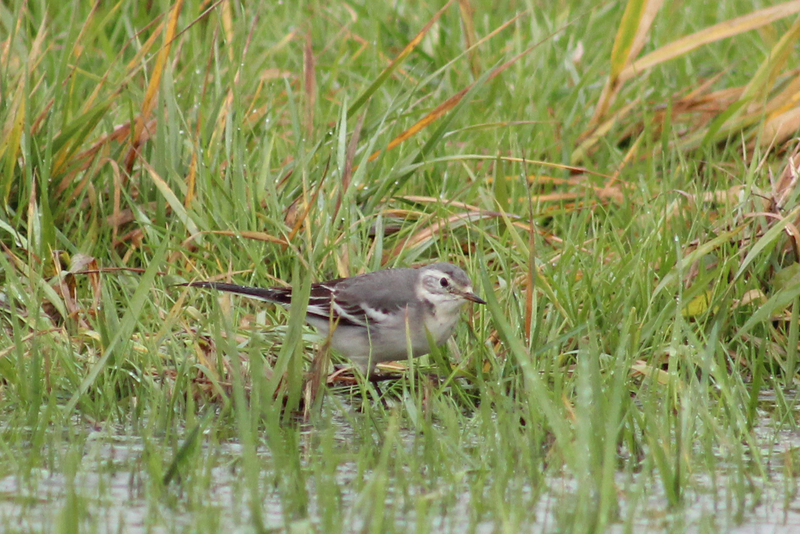 Citrine Wagtail (Motacilla citreola) had only knowingly graced North American soil once before November 14th, 2012. The first record was a mind-boggling two-day affair from Starkville, Mississippi just over 20 years ago. On the 14th, Dave and Adele Routledge decided to check the birds down a seemingly random farm road in the Comox Valley. The whole Comox Valley looks great for birding, with the Courtenay River Estuary being one of the most obvious features. Why Dave and Adele chose to head to the other side of Comox Rd. that day and head down that dirt lane is a mystery, but they were amply rewarded for thinking outside the box! 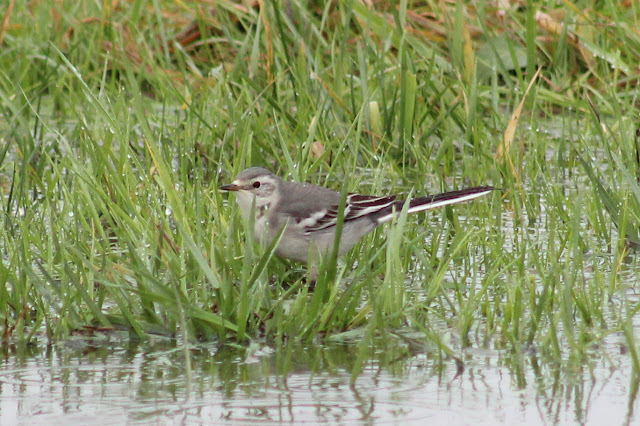 Having experienced Yellow Wagtail some 50 years ago back in England, Dave knew he was looking at a wagtail when he found an unusual grey-and-white bird bobbing its tail. He made several keen observations and presumed it was a Yellow Wagtail. The description left no doubt that he had observed a wagtail, but no diagnostic features that separated it from other wagtails were mentioned. I felt obliged to inquire why he thought it was a Yellow - an Eastern Yellow Wagtail (M. tschutschensis) to be precise with modern taxonomy - and not one of other potential options. I mentioned Grey Wagtail (M. cinerea) and White Wagtail (M. alba) as other likely candidates to show up, but didn't even think of adding Citrine to the mix as it had never been recorded in Alaska. Dave decided he had better go back out and go over the identification in greater detail. 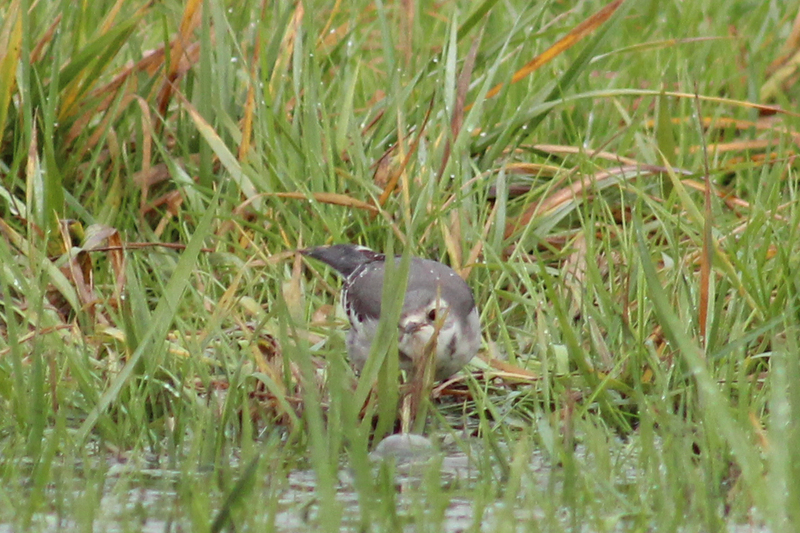 Amazingly, he returned to the wagtail's original location two days later and managed to relocate it. After longer looks in better light, the identification shifted towards the White Wagtail camp based on the more plain-faced appearance, grey back, two broad white wing bars, and white forehead. The feature that didn't add up for White, though, was the lack of any kind of black markings on the chest. At this point, no photos had been taken but the shifted identification and up-to-date sighting put a handful of birders into action the next day. Mike Bentley was one of the few that made the journey and he came prepared with his camera and finally the bird was documented! Once the photos were posted to BCVIBIRDS, the real excitement began. Word soon spread that this looked like a classic 1st-winter Citrine Wagtail. I grabbed my Birds of East Asia field guide, thumbed through to the wagtails, and could immediately tell why I couldn't come to grips with the bird being one of three more expected wagtail species. CITRINE... expletive deleted... WAGTAIL! 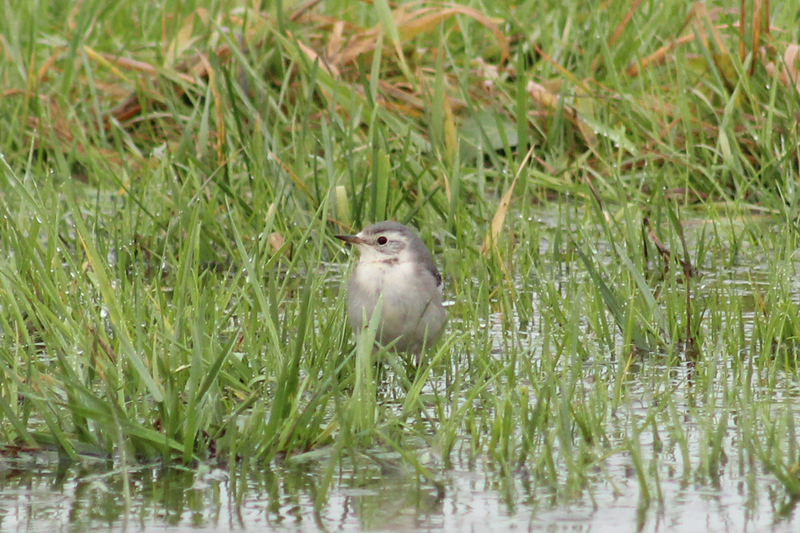 Luckily I had already made travel arrangements to go up and see the wagtail. Jeremy Kimm and I had just attempted a big day on Saturday and decided rest was for the weak. He was a real trooper and picked me up at 5 a.m. even though I was the wrong direction. We picked up his brother, Jason, in Duncan on the way up to the Comox Valley and the three of us were on location just after 8:30 a.m. 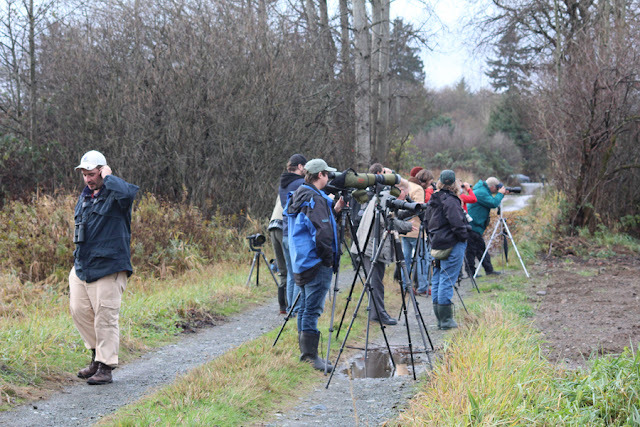 I rarely make my way up to the Comox Valley, so I was able to put some unfamiliar faces to familiar names as Dave Robinson, Art Martell, and Terry Thormin were there scouring the area for the wagtail. Additionally, one familiar-yet-enigmatic face was in attendance as Keith Taylor had made the drive up the night before to be there for first light, and Mike Yip was sporting the long lens in hopes of getting some primo documentation. They informed us they had not yet located the wagtail. That all changed five minutes later when Art scanned around edge of the southwest corner of the field. I was right alongside Art when he exclaimed "There it is!" He notified the others and soon we were all taking in full frame views of the bird in our scopes! The field marks were all there for a 1st-winter Citrine Wagtail: white completely framing its grizzled auriculars, a clean grey back with no hints of olive or brown, white supercilia connected by white over the bill, immaculate white undertail coverts, and two bold, white wing bars. The next task was to get some photos to document the bird. After all, we were dealing with a first Canadian and second confirmed North American record. The bird was quite cooperative and everyone was very respectful of the bird's space, knowing that birders from the Lower Mainland were on their way. 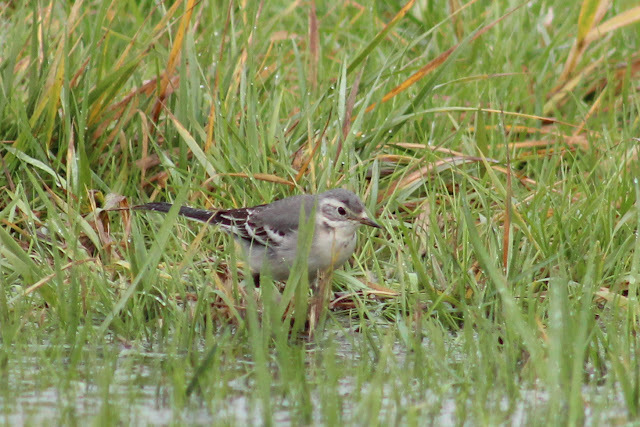 Eventually I managed to get some decent shots when the Citrine Wagtail was at its closest. I even took some poor footage of the bird to document its call. Later we were joined by a half-dozen or more Lower Mainland birders that made the ferry trip over and, needless to say, they were happy twitchers! I don't think I need any more commentary on this amazing bird, but I will close this out with a big congratulations to Dave and Adele Routledge for their amazing find! Giant crowd... from a British Columbia perspective! Incredible bird, Jeremy - and great job documenting it. Pretty jealous over here on the "other" coast (Newfoundland)!! Picked a great fall to dash off, haha. I'm sure you guys will be reminding me of this for years to come! Though I'm not too sour---Gilbert's Whistler and a few lifer herps tomorrow!